Small talk is part of everyday life. Being able to speak easily in these situations gives us confidence for future conversations. While some people are naturals at small talk, there’s always room for improvement. 1. “A golden rule is that you don’t have to be brilliant-just nice,” says Bernardo Carducci, director of the Shyness Research Institute in New Albany, Indiana. “If you start with simple, even obvious comments, that makes it easier for others.” Here are ten rules gleaned from communication specialists. A bit of preparation helps. Driving to a party, come up with two or three things to talk about in case the conversation runs dry. Try to remember things about your host and the other people who will be there, like her passion for skiing or a charity she’s supports. Think of things that give them something to talk about. If they love art, ask about their collection. Generally, a firm handshake is a safe, neutral bet. In social situations where faces are familiar, the rules soften. Hugs or even a peck on the cheek is fine with good friends. It’s often easier to take your cues from the other person. If they outstretch a hand or lift both arms for an embrace, respond accordingly. Remember how you have greeted in the past. Most importantly, smile! Remember names. Begin the conversation by giving the other person something to work with. But don’t put her to work. For example, if asked what you do for a living, don’t give a short answer, thereby forcing the other person to scramble for more questions. “Embellish” your response by including a little story even some humor. particular like the person’s shoes, clothing, or jewelry these often say much about the person. Asking what the meaning of a piece of jewelry has for its wearer can open up lots of topics. 6. When in doubt, discuss the setting. 7. Revive a dying conversation. Don’t panic when there’s a lull in the conversation. Silences are as long as they seem. Think of silence as a transition. Sometimes it is appropriate. You don’t want to sound like a babbling idiot! If you sense the other person is wanting to get away, give them the opportunity to do so. Otherwise, take the conversation in a new direction using one of the above ideas. 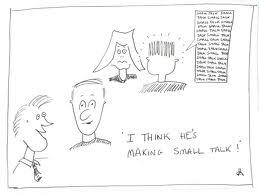 The true hallmark of a skilled and gracious small talker is the ability to introduce people with ease. In addition to announcing names, offer a piece of information about each person, or a shared interest, thereby facilitating a conversation. Try to be genuine and sincere, and convey that each person is important. Say the names slowly and use it again as you share information. For every group of lovely people you meet, there’s bound to be a lemon. One type is the person who has met you on several occasions but acts as if he’s never seen you before. Say something like, “You may not recall, but I remember meeting you at the presbytery meeting two years ago.” Another type of lemon is the person who invades your personal space. You have to say anything: just move back. If he gets you against the wall, maneuver around them. If they keep following you, extend your arm holding a drink or turn sidewise to them, keeping them an arm’s length away. The third type won’t stop talking about himself and hasn’t asked you a single question. If a person is this self-centered, exit the conversation gracefully. 10. Make a clean getaway. Use the phrase, “I need.” Say, “I need to get some food; I haven’t eaten all day” or “I need to talk to that person…” or “I need to meet the speaker.” Freshening your drink, using the restroom, chatting with a friend who has just arrived, and checking on a spouse are also valid needs. Before you leave, mention something from the conversation that meant something to you. This shows you’re not just running off because you’re bored.